Showing search results for Befriending Someone On Facebook Quotes, Quotations & Sayings 2019. 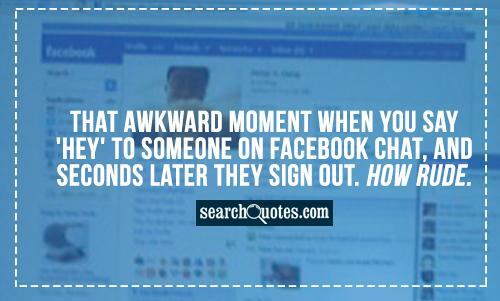 That awkward moment when you say 'Hey' to someone on facebook chat, and seconds later they sign out. How Rude. That awkward moment when someone deletes their comment on facebook and you look like you're talking to yourself. Telling someone that you're going to bed, when you're actually not and then having to hold back from posting things on Facebook/Twitter. That awkward moment when you post a funny status on Facebook and someone has to ruin it by commenting being all serious. If you feel a bit lonely, forgotten, or just need someone to cheer you up remember...You can always change your birthday on facebook! Feeling rejected after someone reads your message on facebook and doesnt have the manners to reply?! Fridge full of food - Nothing to eat. Wardrobe full of clothes - Nothing to wear. Internet full of sites - only on Facebook.